Other Notes: includes two sets of adult electrode pads, battery, soft carry case, and quick reference card. The rugged Physio-Control LIFEPAK 500 AED is one of the most popular and most deployed AEDs ever made! Hundreds of thousands of these devices are in use all over the world. Physio-Control and LIFEPAK are legacy names in emergency defibrillation. The LIFEPAK 500 was discontinued by Physio-Control on January 26, 2007. Physio-Control stated it would provide replacement accessories, such as electrode pads, replacement batteries, chargers, cables, testers and support documentation, until at least 2014, seven years following discontinuation. AED Superstore continues to carry these products because Physio-Control is still offering replacement parts for the LIFEPAK 500 AED. We will continue to bring you everything you need to maintain your LIFEPAK 500 AED as long as Physio-Control makes these products available. Easily find replacement products for your LIFEPAK 500 either by category below or in the “Related Products” section a bit farther down the page. Owning a LIFEPAK 500 AED puts you in great company with the other tens of thousands of owners of this device. They've trusted Physio-Control for years. Most EMS agencies in the United States rely on Physio-Control for pre-hospital defibrillation equipment. 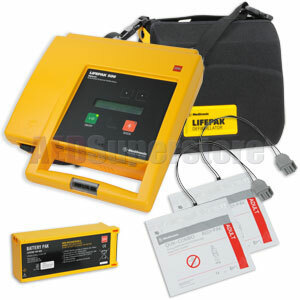 Small businesses to large corporations use LIFEPAK as well. The features and configurability of the LIFEPAK 500 make it user-friendly. Its technology makes it a proven life-saver. Like all AEDs, this one talks you through the rescue. But that's just the start. It also has an LCD display so you can read the instructional prompts if background noise prevents you from hearing them. The device uses Physio-Control's escalating biphasic electrical waveform. This means the AED will escalate its energy output if the patient's situation demands it. (All LIFEPAK AEDs have this feature.) The AED tests itself regularly and the readiness indicator displays the machine's status. You don't have to turn the AED "on" or do anything else to know if it's ready-to-use. Depending on the method of CPR you've been taught, you can program the device to prompt for pulse checks. Electronically assign a unique device ID to the LIFEPAK 500 so you won't have to put labels, stickers, or magic marker identifiers on your AED. Although it ships with a disposable long-life battery, the LIFEPAK 500 is one of the few "public access" style AEDs with a rechargeable battery option. And it uses standard Physio-Control QUIK-COMBO (link to: or pre-connected REDI-PAK electrodes. See our Resource Center article on Rechargeable vs Non-Rechargeable Batteries for more information. This device is also pediatric capable with the use of optional pediatric electrodes. Don't forget about training, either! It's easy. An economical, full-size, reusable LIFEPAK 500 Training Unit is available from the AED Superstore, too.